Ginsburg down. 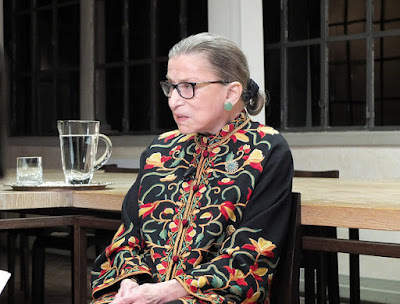 Updating coverage: Supreme Court Justice Ruth Bader Ginsburg suffered a fall at her office, fracturing three ribs—and was taken to a hospital. Trump’s big moves. CNN’s Chris Cillizza says the president’s firing of Attorney General Jeff Sessions—and his choice of a replacement, Sessions’ chief of staff Matt Whitaker—effectively puts the president in control of the investigation of himself. ■ … and he led a secretive anti-Democrat group. ■ Politico: Special counsel Mueller can protect the investigation—even if he’s fired. ■ Progressive organizers are calling for demonstrations across the country today at 5 p.m. to protest Trump’s machinations. ‘Unprecedented punishment.’ The Reporters Committee for Freedom of the Press is demanding restoration of the credentials the Trump administration yanked from CNN reporter Jim Acosta after the president’s contentious news conference yesterday. ■ … which an ex-FBI special agent says meets the standard of proof for libel. ‘Horrific.’ Updating coverage: Thirteen people—including the gunman—are dead in an assault on a Southern California bar. ■ It happened at a “College Country Nights” event for students at California Lutheran University, which has canceled classes. ■ What we know about the shooter—an ex-Marine. ■ A Democratic gun-control advocate has won a long-Republican congressional seat representing Georgia …. ■ … where Republican gubernatorial candidate Brian Kemp, stuck in a cliffhanger election, is quitting his job as secretary of state and—a little late for some critics—forsaking all his election-related duties. Targeting Target. Mayor Emanuel’s signed a new executive order designed to prevent a repeat of Target’s move to close two stores in the city. ■ The mayor’s seemingly abandoning hope Chicago will land Amazon’s headquarters project. ■ Emanuel, whose tenure will overlap Gov.-elect J.B. Pritzker by four months, says he’s hoping to secure fresh funding for Chicago-area transportation programs. ■ Democrat Pritzker’s transition team includes a former Republican governor. ■ The latest residential property tax assessments for Cook County bring dramatic changes for many neighborhoods—up and down. ■ Thanks to Patrick Olsen at Consumer Reports, Square stands freshly reminded that “newly gained” doesn’t take a hyphen—as it did in yesterday’s edition.